Sorry, Deepak, I love cold pepperoni pizza. I’m also not fond of spending big bucks for crappy cafeteria food, so I pack my lunch, refrigerate it, and—gasp—reheat it in the microwave. I know, I know. According to your book WHAT ARE YOU HUNGRY FOR?, I’m not supposed to do these things. You say these are FLUNC foods: frozen, leftover, unnatural, nuked, and canned. But, it’s who I am. 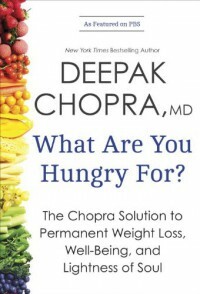 You know, Deepak, why don’t we just take out that whole Part I of your book? Can we do that? I mean, you never really give your research or sources for your claims. I mean, look at Dr. Oz. He’s testifying to congress for doing the things you’re doing in your book: making statements without substantiation. I’ve read THE BIG FAT SURPRISE and she’s made some pretty well-documented points against what you’re claiming. Besides, do you really think Steve Jobs would still be alive if he ate more jalapeños? (Though Jobs wasn’t mentioned, you do claim that jalapeños “kill cancer” in the pancreas and lungs.) Oh, and my doctor says cinnamon isn’t the best way to lower my LDL cholesterol. I think I’ll stick with the advice the doctor offered in THE DIET FIX for this type of stuff. But, let’s talk about the positive. Deepak, I love Part II. This is you. This is what I came expecting, craving. I read THE TAPPING SOLUTION’s guide to weight loss, and they echo a lot of what you say. This is the holistic approach I was looking for. Stuff like your acronym STOP: stop what you’re doing, take a 1-minute break, observe the body’s sensations, and proceed with awareness. I like that your definition of awareness includes bodily, emotional, and choice awareness. I love that you say mindfulness includes SIFY: sensations, images, feelings, and thoughts. This is who you are; I would be more than happy if your book was only one-hundred pages of this. Great! As for the meditations, I know not everyone will follow your advice to say “om varunam namah”. Heck, I don’t even know if I can remember it without peeking. But it is nice to think “my life is in harmony with cosmic law.” Nice. Oh, and Deepak, those recipes in back are good, but I don’t have those twenty-one (21!) ingredients to make your Mulligataway Soup. Can I leave out the Bragg Liquid Aminos? And I’ll take your word about “The Chopra Center’s Unbelievable Double Chocolate Cake”. I just can’t picture it being very tasty with 12 ounces of low-fat silken tofu. Oh, and can you tell those folks at Harmony, Crown, and Random House thanks for sending this book to me for review? They all are great people, and I would love the chance to review your other upcoming books.